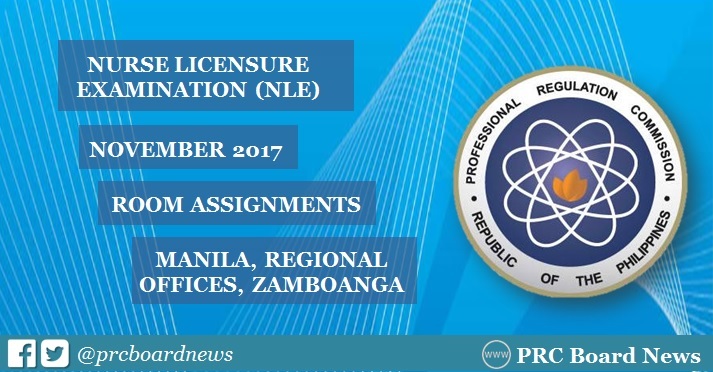 The full list of room assignment for November 2017 Nurse Licensure Examination (NLE) or nursing board exam are available on this page as officially released by the Professional Regulation Commission (PRC) Manila and all regional offices nationwide in few days before the exam. The PRC and Board of Nursing (BoN) will administer nurse licensure examinations on Saturday and Sunday, November 25 and 26, in Manila, All Regional Offices (Baguio, Cagayan De Oro, Cebu, Davao, Iloilo, Legazpi, Lucena, Pagadian, Tacloban, Tuguegarao) and Zamboanga. The NLE board exam draws basic knowledge, skills and attitude in the major subject areas i.e. Fundamentals of Nursing including professional adjustments, maternal and child nursing, community health and communicable disease nursing, nursing of adolescents, adults and aged, mental health and psychiatric nursing. PRC Board News together with The Summit Express will also post important updates and results for November 2017 nursing board exam.